This volume contains a collection of miscellaneous musical treatises, compiled probably in the second quarter of the 15th century by John Wylde, who seems to have been the choirmaster at the Abbey of Holy Cross, Waltham, a few miles due north of London, between Enfield and Epping. He wrote it himself, and gave it to the Abbey. It was later owned by his more famous successor, Thomas Tallis (d.1585). 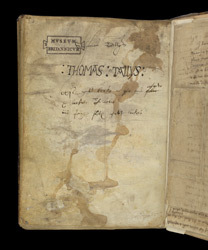 On what was originally the final page of the book is the signature 'Thomas tallys' above the same name in large capital letters.